Colbics is a Marie-Curie Project supporting the collaboration between academic and commercial sectors on the development of biological control solutions to manage crop pests. Three companies developing biological control solutions (natural enemies of crop pests) and three universities or research institutes tightly collaborate on common R&D programs, in an attempt to find new R&D methods and ultimately setup new or improved products, as well as optimized production and quality-control or traceability methods. 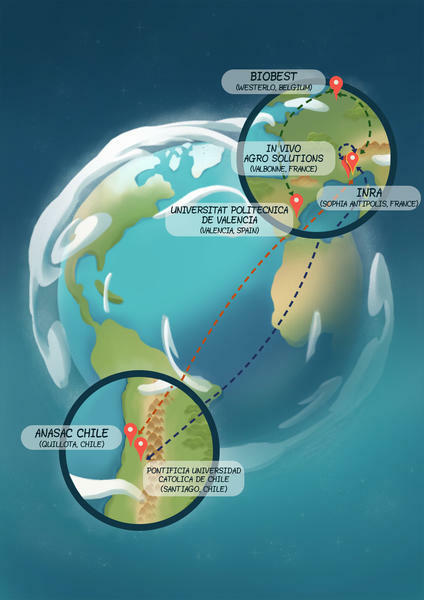 The three companies involved: Biobest (Belgium), InVivo Agrosolutions (IAS, France) and Anasac-Xilema (Chile). The three academic partners: INRA (France), Universitat Politecnica de Valencia (UPV, Spain) and Universidad Catolica de Chile (UC, Chile). The use of DNA characterisation techniques to assist the research of new biological control solutions, and support quality-control or traceability in industrial production settings. The screening and use of intra-specific diversity to select best-performing natural enemy populations and improve the efficiency of biocontrol products. The promotion of biocontrol products through the benchmark of products and their compatibility with other crop protection techniques. The design of informatic tools helping farm-advisors, producers and biological control companies to optimize their use of biological control solutions in Integrated Pest Management packages. The work carried out is further used to generate generic knowledge on evolutionary and ecological processes likely to be relevant in the frame of the development of production of biological control solutions. for the commercial sector: new biological control products or packages of products, improved production methods, quality-control and traceability procedures, increased sales. for the public sector: characterisation of unknown biodiversity of pests and natural enemies, tests of evolutionary and ecological hypotheses, development of model-based predictive methods. Colbics is a IAPP project. IAPP Project are part of the Marie-Curie Actions (Programme "People") of the European Research Seventh Framework Programme (FP7). Marie Curie Actions have build up Industry-Academia Partnerships and Pathways (IAPP) to help public and private research to work together. Partners include universities and companies of all shapes and sizes. The partners altogether propose a project based on a joint cooperation programme. The industrial partners must be operating on a commercial basis. Focussing on joint research projects, IAPPs aim to boost skills exchange between the commercial and non-commercial sectors. The research project of the IAPP team should promote a strategic research partnership, which can be co-ordinated by either an industrial or an academic participant. All scientific and technological research fields of interest to the EU are welcomed by the IAPP team. Networking, workshops and conferences involving external researchers as well as the partners’ own research staff. Strong strategic partnerships are what the IAPP programme is all about. It is looking for long-term, targeted knowledge sharing and staff mobility between the public and private sector partners.